The bartender is a very popular profession, which involves the communication not only with alcohol but also with people, that is not unimportant. To find a good job difficult for everyone: no matter what profession. Therefore, the main role here is played by the persistence and professionalism. 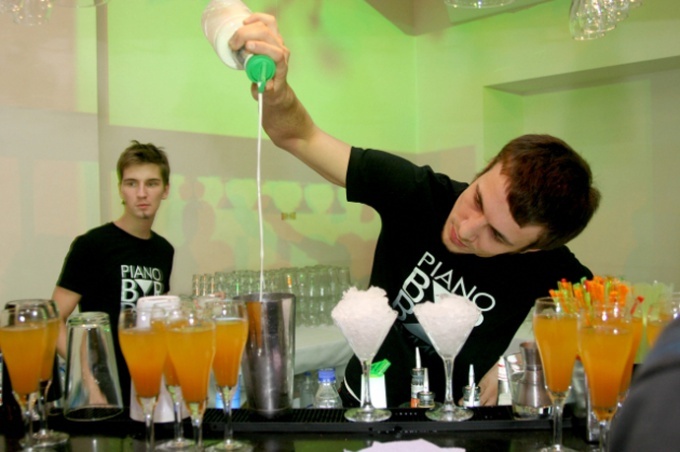 If you only know the basics, or even know that is a bartender go through special courses. To find them will not be more work. Open the local newspaper ads or Craigslist for your city. If such service no one provides, and the city has food College (cooks, waiters, etc. ), see there, there's a 99.9% have such courses. Take as carefully as possible to learn. Be sure to remember all the material and ask everything you do not understand. A special place takes practice. If something does not work – do not despair, try again. Do not forget that the talented are not born, they become. Keep a separate notebook where you write down all the information about alcoholic beverages and cocktails. The bartender is more valuable if it has its own unique cocktail recipes. So don't be afraid to experiment. To work in a prestigious institution, you need experience. Don't be afraid to initially work for low fees - it is only the start of your career. The main task is to "fill the hand". Remember, if you get a job, the employer will be interested in not only experience but also your skills. Most likely he will offer to work a couple of nights where you will be closely monitored. It is at this stage will be determined by your wages, and in General, it will take you to work. Join the Federation of bartenders. Such organization exists in most cities. First, this is an additional image of you as a professional bartender. Second, this method further to gain new skills and share experiences with others. Thirdly – the opportunity to earn. In most cases the Federation of bartenders taking part not only in clubs but also in cultural life of the city as a whole. It is the organization of parties, bar, corporate events, etc. Don't know what courses to choose? Ask those who finishes them. I may not share their experiences.